Para Pembicara Diskusi yang diselenggarakan oleh ISTMI (Ikatan Sarjana Teknik Industri dan Manajemen Industri Indonesia) bersama PT. PGN (Persero) TBK. INDUSTRY.co.id - JAKARTA (IFT) - The Association of Industrial Engineering and Industrial Management of Indonesia (ISTMI) as a forum for professionalism in the field of engineering and industrial management, invites one of the largest downstream energy industry companies in Indonesia, PT Perusahaan Gas Negara (Persero) Tbk to hold a discussion event inspirational titled 'Integrated Ecosystem Industries Demand Creation, Sustainability & Integrated Planning' which took place at The Media Hotel, Jakarta, yesterday. The discussion was conducted to answer the government's declaration in the case of national industry policy targeting the domestic industry sector able to sustain economic growth that can increase the economic rate. 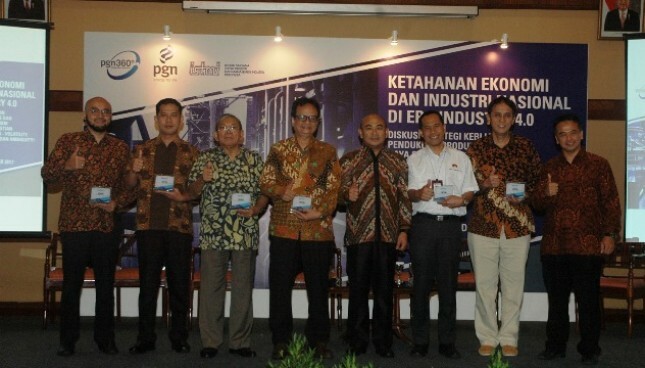 One of them with the growth of downstream energy industry (gas) is sustainable in supporting the increase of productivity and competitiveness of national manufacturing industry. Ir. Faizal Safa, M.Sc., IPM., AER. as a Chairman of ISTMI is pleased to be able to work together with various parties to organize a discussion event titled 'Integrated Ecosystem Industries Demand Creation, Sustainability & Integrated Planning', including several related Ministries and SOEs, especially PGN. "As a non-profit organization we want to contribute to our beloved Nation, that's why we hold this discussion title as one of our commitment and commitment to educate businessmen. This business event itself is intended to encourage increased productivity and industrial competitiveness of the country and recognize the conditions, challenges and opportunities that exist and how to respond," said Faisal. "Industry also needs to be seen thoroughly, both from the side of premier industry - secondary and tertiary. And this can certainly be done with the role of government to help improve the country's industry. The industrial sector has become the main motor of the national economy. Among others are through three main industries namely food and beverage industry with the average of transportation equipment industry and metal goods industry, compute, electronics, optics and electrical equipment. These three branches of industry become the main driving force of the national industry sector. The magnitude of this role signifies the strengthening of industrial structures toward higher value added production and higher use of production technology," said Faisal Safa. On the other hand, President Director of PT Perusahaan Gas Negara (Persero) Tbk, Jobi Triananda Hasjim feels optimistic that this event can be utilized by all participants for sharing knowledge. "We strongly support the implementation of inspiring discussions such as those initiated by ISTMI which have the same goal in providing the skills, energy and infrastructure that are indispensable in boosting domestic economic growth. We continuously strive to continue to strengthen the distribution of natural gas and become an integrated energy solutions provider that encourages the utilization of natural gas for the needs of local communities and industries," Jobi said.